Members of the Salt Grass Trail Ride, the oldest and largest ride, trot triumphantly on their Appaloosas into Houston’s Memorial Park. One of Houston Livestock Show and Rodeo’s most iconic events ends before the rodeo even begins. at the corner of Bagby and Walker streets. As I drive west on Beckendorf Road in Katy, the riders appear on the western horizon of the road ahead like a mirage. Scores of horseback figures and a group of covered wagons warp on the horizon in the blazing noonday sun, dust blooming in puffy plumes from the horses’ hooves and the wagons’ wheels. They drift, cloudlike, across the bluebonnet-bedecked pastureland. Having just cleared the Grand Parkway, the third outer loop around Houston, and departed the city’s concrete canyons for the rolling grasslands of the Katy Prairie, I might be forgiven if my mind’s playing tricks on me. 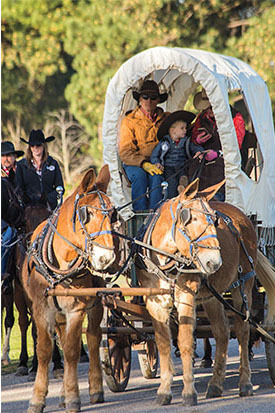 Mules pull one of the Salt Grass wagons out of their campsite at Houston Farm and Ranch Club. But it’s not. I’ve been invited to lunch this February afternoon by members of Wagon No. 13 of the 1,200-rider, 24-wagon Salt Grass Trail Ride—the oldest of the 11 trail rides heading for Houston. 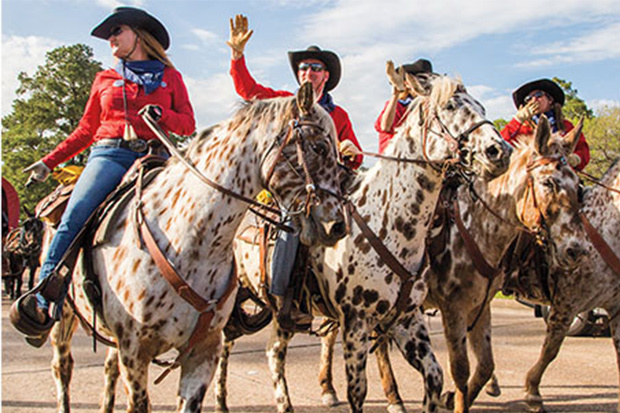 All in all, nearly 3,000 riders and approximately 100 wagons will converge in Houston’s Memorial Park to participate in the Downtown Rodeo Parade, which heralds the opening of the Houston Livestock Show and Rodeo. 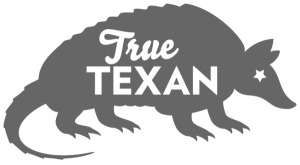 The 2018 event marks the 80th anniversary of the parade, which commences in downtown Houston on Feb. 24 and showcases the 11 HLSR trail rides that arrive in Houston from all points of the compass. Each of the 11 rides has its own distinct personality, but arguably none can match the exuberance of “The Granddaddy of ’Em All,” the Salt Grass. In keeping with Texas-size standards, it’s the world’s largest organized trail ride. The idea for the first ride hatched over lunch at the posh Cork Club in Houston’s now-defunct Shamrock Hotel back in 1952: As Brenham Mayor Reese Lockett launched into a romanticized reverie about his younger days spent on horseback driving cattle from the Hill Country to the Gulf Coast as a young man, a buddy chided him, saying, “Reese, you couldn’t ride your horse from Brenham to Houston.” The gauntlet thus thrown, Lockett determined to saddle up and follow the old Salt Grass Trail into Houston for the opening of Houston Fat Stock Show (the precursor of today’s Rodeo). He coaxed rancher friend E.H. Marks into joining him on horseback, with ranch hand John Warnasch driving a mule wagon, followed by a second wagon carrying KPRC reporter Pat Flaherty, who chronicled the adventure. Lockett soon had newspapers and television stations vying for coverage. As they rode toward Houston, a dozen or so other riders fell in. By 1959, Lockett’s little “publicity stunt” had swelled to more than 2,000 riders accompanied by nearly 100 wagons and comprised men, women, and children from all walks of life. 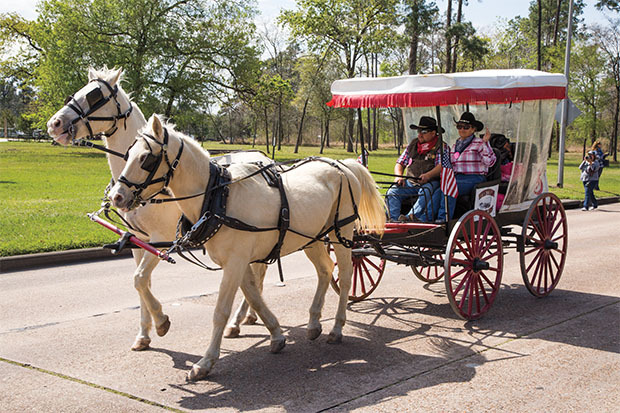 Two participants in the Texas Cattlemen’s Trail Ride arrive in style in a fringed wagon. Celebrating its 66th anniversary this year, the Salt Grass Trail Ride sowed the seeds for 11 more trail rides, 10 from across Texas and one originating in Logansport, Louisiana. Each of the 11 rides has its own distinct personality, but arguably none can match the exuberance of “The Granddaddy of ’Em All,” the Salt Grass. The ride takes its name from the region’s signature salt grass, which does not die back during winter as other grasses do. Early Texas cattlemen, before northern routes became profitable, would overwinter their herds on the mineral-rich, salt-tolerant, thick grass to fatten up before driving them east to market in New Orleans. Among the Salt Grass Trail Ride’s 24 wagons, arguably none are as style-conscious as the Desperados’ Wagon No. 13 with internationally acclaimed Western fashion designer Pat Dahnke, who has ridden the Salt Grass every year for 33 years, serving as its dress code officer. Each day’s outfit is classy yet practical: a brimmed dark hat (felt or straw) with a stampede string, dark boots, blue jeans, and matching shirts and bandanas. On the back of the saddle, a neatly rolled yellow riding slicker emblazoned with the Desperados logo completes the look. Dahnke started riding the Salt Grass in 1986 with her 5-year-old daughter, Tara. This year marks the 32nd ride for the duo. For the past several years, Tara—a horse trainer by trade—has served as the Desperados’ wrangler. The steeds run the gamut from the classic “bulldog-type” quarter horses to spectacular leopard Appaloosas, flashy paints, and caramel-hued palominos. Draft horses—including a particularly striking team of Belgians—pull wagon duty. Riders from as far away as Singapore, Iraq, Germany, and France fly in to participate in this historic event, as do riders from across the country. “The Rodeo starts in winter and ends in spring,” is an expression you’ll commonly hear around Houston—February’s fickle weather means those on the trail ride must be prepared for stinging sleet, heavy rains, and possibly even tornadoes. The Salt Grass, with its size, moves like an advancing army. Before the riders arrive at today’s designated lunch stop, a leading battalion comprising RVs, dualies pulling horse trailers, “chuckwagon” trailers, and semitrucks hauling flatbeds of portapotties had prepared for them. And like drill sergeants, the trail bosses of the 24 wagons hold all riders to the pre-ordained timetable. Prairie View, the first black trail ride, celebrates its 60th anniversary this year. Lest this all sounds too structured, don’t doubt that the Salt Grass riders can kick up their boot heels with the best of ’em. They plan ahead for the pajama parties, costume parties, and motor-home “open houses” at their nightly stops—and enjoy the camaraderie of communal meals around the campfire, often followed by evening sing-alongs. “One year, we had both Elvis and Billy Gibbons look-alikes at the costume party,” Dahnke says. “That might have been the year we danced on the tables until they splintered.” Clearly, the ride delivers plenty of fun and hijinks alongside its regimented discipline. Generations of families, plus friends, associates, and total strangers have all become saddle pals because of the Rodeo Parade. To the west, the Mission Trail Ride began its ride a full two weeks prior to the parade at one of the oldest missions in Texas—San Antonio’s Mission San Francisco de la Espada. The Mission Trail Ride celebrates the history of the early vaqueros and cowboys who drove cattle east from San Antonio to New Orleans over the Opelousas Trail (roughly along the route of modern-day I-10, and along or parallel to the Old Spanish Trail). On the first documented Texas cattle drive in 1779, Francisco Garcia drove 2,000 head of cattle east from San Antonio to New Orleans over the Opelousas Trail—long before the northern-bound Goodnight-Loving, Great Western, Chisholm, and Shawnee trails would enter Texas lore. Later that day, I wheel my Jeep into the vast parking lot east of the Sam Houston Race Park, where the Prairie View Trail Ride is stopping for the night. The first thing I notice is the striking difference in their horses versus the other rides’ horses. Slick, elegant, and leggy, they can be none other than Tennessee walking horses. “You’re right about that,” Trail Boss Myrtis Dightman tells me, with his signature booming laugh. “The new generation of the Prairie View ride has moved toward walking horses for speed and comfort.” With their distinctive four-beat running walk in lieu of a bouncy trot, Tennessee walkers are among the smoothest-riding saddle horses in the world. The Prairie View Trail Ride originates in Hempstead on the Sunday prior to the Downtown Parade, spending Sunday night through Tuesday morning in Prairie View. There’s a show-and-tell at Jones Elementary School on Monday morning, and its Prairie View Trail Riders Chili Cook-Off takes place just west of the Prairie View A&M football stadium in the afternoon. “We want to communicate and preserve the traditions of the black cowboy,” Dightman says. Two members of the Prairie View Trail Ride move in for a smooch during a stop at Katherine Smith Elementary School in Houston. 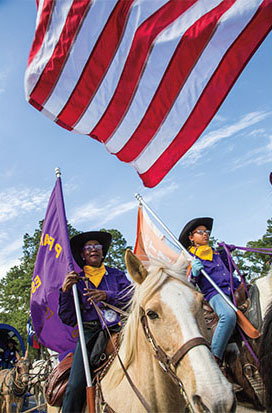 His father, Myrtis Dightman Sr., co-founded the Prairie View Trail Ride in 1957, at a time when the black trail riders needed to be accompanied by armed guards to enter Houston’s Memorial Park. 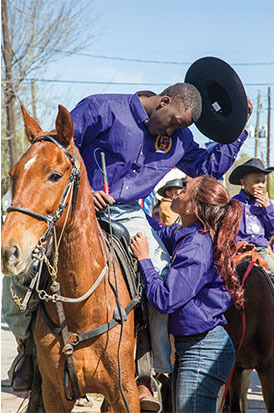 Known as “The Mother of Black Trail Rides,” the Prairie View ride focuses on the contributions made by black cowboys to Texas’ ranching heritage. Dightman, now in his 60s, has been riding the Prairie View since he was a 2-year-old. He proudly tells me that his grandson Myrtis, 11, has also been on the ride since he was 2. Dightman, who has been serving in a management capacity with the Prairie View riders for more than a decade, divides his trail boss responsibilities into two parts, the ride and the parade. Indeed, when all 11 of these trail rides have threaded their way into Memorial Park to share tales of the trail—with riders of many nationalities from many walks of life—it’s as vibrant a fabric of Texas diversity as one could imagine. And something magical must be in the moonlight that Friday night. 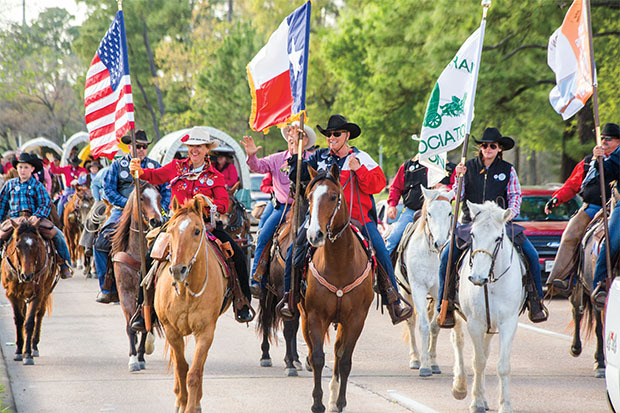 As the sun rises over Memorial Park Saturday morning, thousands of riders and horses, accompanied by hundreds of wagons, have woven themselves into one unified tapestry as rich as Texas itself, unfurling east toward the sun to the Downtown Rodeo Parade. Participating in the parade has its rewards, of course: In 2017, HLSR named the Salt Grass “Top Trail Ride” of the parade, with my lunch “pardners” of Wagon No. 13 winning “Best Show Wagon.” Dightman’s diligence in reminding his riders to be at their best for the Saturday parade earned Prairie View the coveted “Best Appearing Group” of the parade. Still that’s not what makes him the proudest. Susan L. Ebert, a lifelong horsewoman, enjoyed getting reacquainted with old saddle pals and meeting new ones while reporting this story. Despite the excellent advice of W.C.Fields, Texas Highways photographer Will van Overbeek often works with animals and children. He has been photographing life in Texas for magazines since 1979. To learn where you can best see the 11 trail rides pass or enjoy one of their stops at parks, schools, or nursing homes, visit rodeohouston.com.